First of all: is it high tea or afternoon tea? 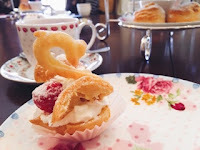 I had incorrectly thought high tea was simply the frou-frou name for the same event. 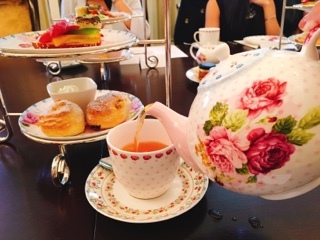 When in fact, according to About Food, afternoon tea is actually the more elite social gathering of the two. 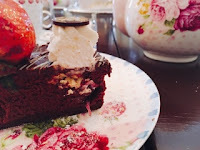 Since it happens in the afternoon, the foods served are lighter; small cakes and sandwiches, essentially the items we traditionally link to the occasion. 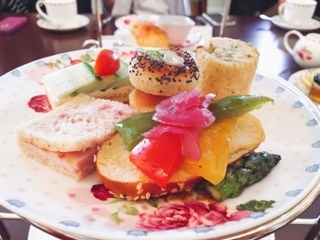 Whereas, high tea occurs in the evening when the working masses are done for the day: meals are heavier, even including items such as fish and meat pies. Hopefully, that assures you I’ve named the post correctly. 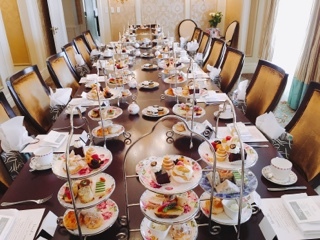 The Fairmont Royal York is a great place in Toronto to indulge in afternoon tea. 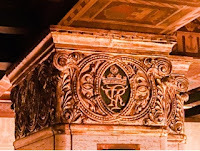 The hotel, a historical landmark to our city, is rich with architectural elements and the elegant touches that makes having tea there an experience. Not to rest on their laurels, Executive Chef Robert Mills recently re-vamped the menu, taking inspiration from properties across the world – including the Savoy in Britain – while maintaining some tried and true favourites such as their signature Chantilly Swan. 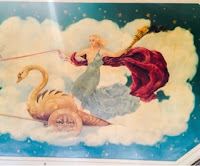 Interesting fact: this pastry was inspired by the hand painted ceiling in one of the hotel’s ballrooms. Vibrantly coloured grilled vegetables sitting on a soft pretzel spread with hummus, great for the summer months. Encapsulated in airy brioche is smoked turkey breast slightly sweetened with cranberry aioli and a crunchy chicken salad mixed with caramelized pecans for added texture. The smoked salmon mini bagels are cute and dainty, the essence of afternoon tea sandwiches. Even the traditional cucumber sandwich is jazzed up by being served open-faced in a beautiful fan and the cream cheese spiked with pink peppercorn. Yet, Chef Mills understands when to leave things alone, which is the case when it came to the scones. The recipe has been used in the hotel for decades; these freshly baked biscuits simply require plenty of silky Devonshire cream and preserves to spread on top. 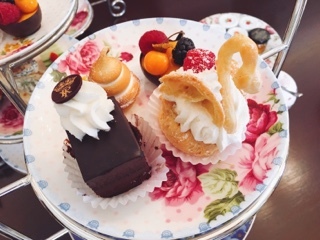 The top tier holds a tempting selection of pastries: aside from the cream puff swan there’s also a rich dark chocolate truffle torte, cute meringue tart and a chocolate cup filled with refreshing guava cream with fruits. 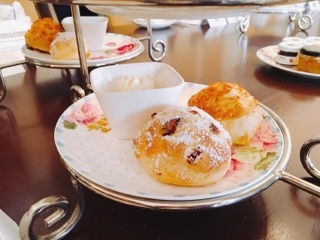 In celebration of Queen Elizabeth II’s 90th birthday, I was lucky enough to get invited to experience afternoon tea inside the ROYAL SUITE … the same place the Queen herself (and consequently Prince Harry just the week prior) stays in when they visit Toronto. With two bedrooms, two bathrooms, a comfortably sized living room complete with fireplace and full dining room (perfect for private dinner parties), the Fairmont Royal York is the official royal residence. 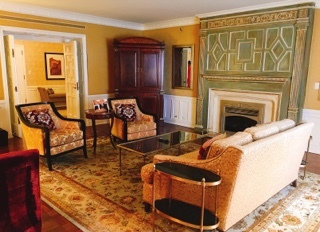 In fact, the family even stores personalized furniture at the hotel, which gets moved into the suite before they visit. 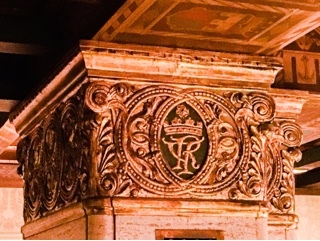 Alas, staying at the Royal suite is by invite only; under normal conditions it hosts other world leaders (Bill Clinton) and an array of celebrities (Leonardo Di Caprio, Justin Bieber, Helen Mirren and Vin Diesel). As a special treat, Chef Mills served a chocolate biscuit cake (not normally part of their afternoon tea menu), the same cake served at Prince William and Princess Kate’s wedding. 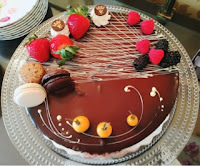 Chocolate lovers would swoon with its luscious smooth dark chocolate interior, crunchy bits of cookies along the circumference and silky sweet ganache on top. It’s a rich cake, but went particularly well with the Librarian Liberation whiskey chai tea, a bespoke blend made at the hotel that smells faintly of whiskey but packed with the taste of exotic spices (cardamom, cinnamon and cloves). The tea is so flavourful it didn’t need milk or sugar. 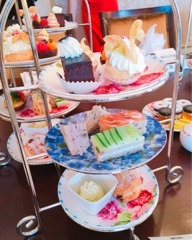 Afternoon tea ($50 per person) is normally served in the hotel’s Library Bar (near the lobby) on Saturday and Sunday with 12:00, 12:30 and 2:30 seatings. 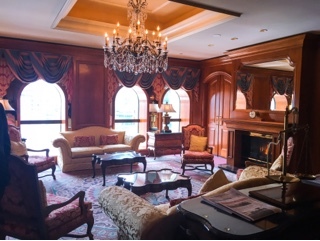 After the filling meal, stick around for the complimentary tour at 2:00 and 4:00 where you’ll be whisked around the hotel, learning interesting details and even visiting areas not normally accessible to the public (including the hotel’s rooftop that houses over 300 honey bees and herb garden)! 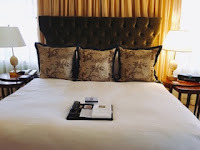 The hotel has come a long way since it started as its own city within Toronto – spoiler alert from the tour: Royal York use to have a connected golf course, bank, 12,000-book library and even hospital beds on site! Nonetheless, in a world that’s always changing, sometimes it’s nice to embrace tradition, slowing down and simply relaxing over a cup of tea. The fact that the tea comes with three tiers of delectable sandwiches and pastries? You deserve the royal treatment. Disclaimer: the above meal was complimentary. Rest assured, as noted in my mission statement, I will still provide an honest opinion.